Crisp and clean, this Ernestine leather-look fabric loveseat creates a chic atmosphere you can enjoy year-round. 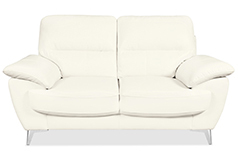 Finished in a radiant shade of white, this fresh-looking loveseat will brighten your space in no time flat. Savour the restful relief of the plush, high-density foam packed inside each seat and back cushion. You won't have to worry about being too hot or too cold – breathable leather-look fabric ensures your comfort always comes first. 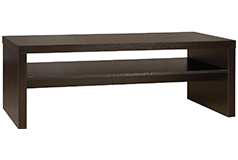 Plus, chrome-finished metal legs give your Ernestine loveseat a final glamorous touch. Key Features: Casual yet stylish, this sofa adds a contemporary boost to your living space. 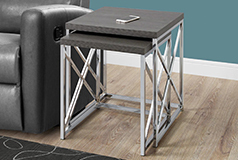 Chrome-finished metal legs provide polished, chic support. Breathable, leather-look fabric feels fabulous and looks sleek in your modern space. Plump and soft, the high-density foam lines the seats and back cushions of this couch.